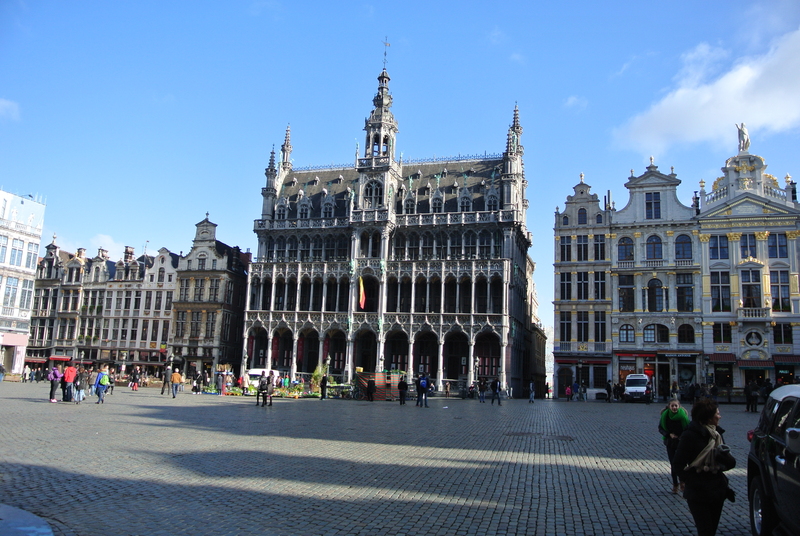 I’m showing with a new gallery , The Roberto Polo Gallery in Brussels. I’ll be having a show there in a few years time, no fixed date yet, lots of new work and this show will also tour to a public gallery in the UK. 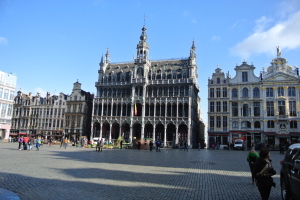 It’s in the beautiful Old Quarter of Brussels near The Grand Place. 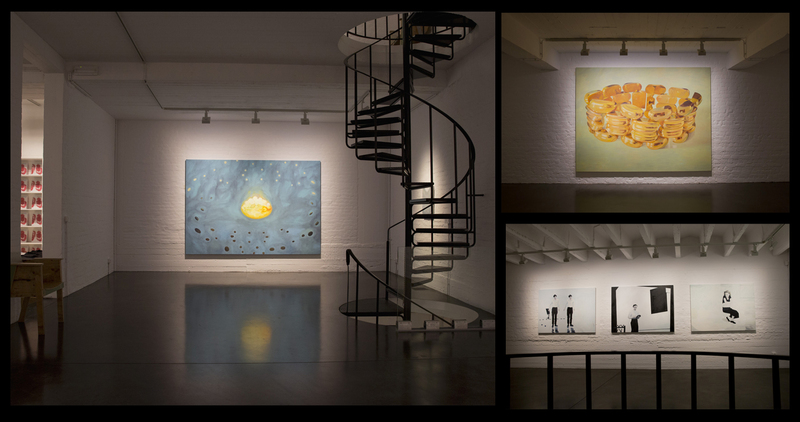 Here’s a shot of the current show there by the acclaimed artist Jan Vanriet . 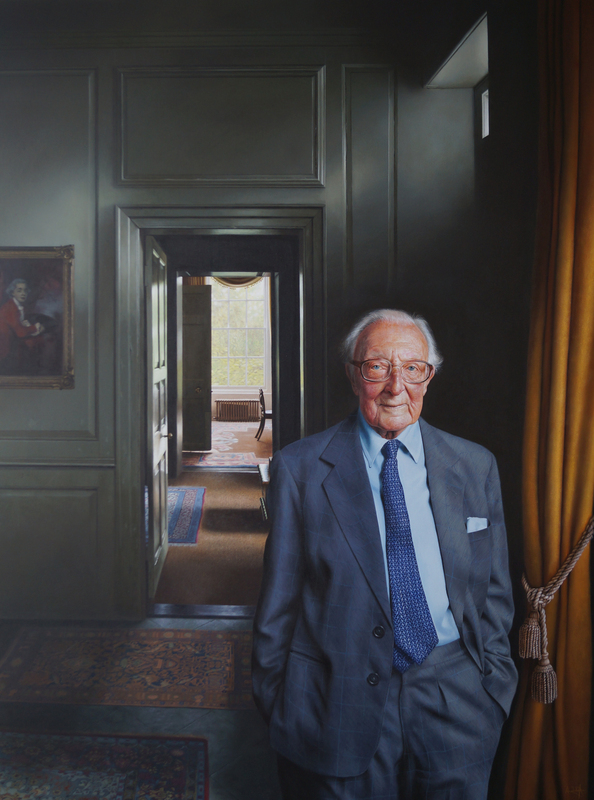 The Palace of Westminster contacted me to do a portrait of Lord Carrington which I worked on for quite a sizeable portion of last year. It’s set in his manor house in Buckinghamshire and I liked the atmospheric lighting of the space, it’s proportions and link to his ancestry. It was unveiled in February at the House of Lords and it seemed to go down very well. One Lord came up and complimented me and said his son ran an art gallery in a very matter of fact way, as if it was a small Cornish gallery in Penzance…”Yes, it’s called White Cube, have you heard of it ?” Said Lord Jopling. 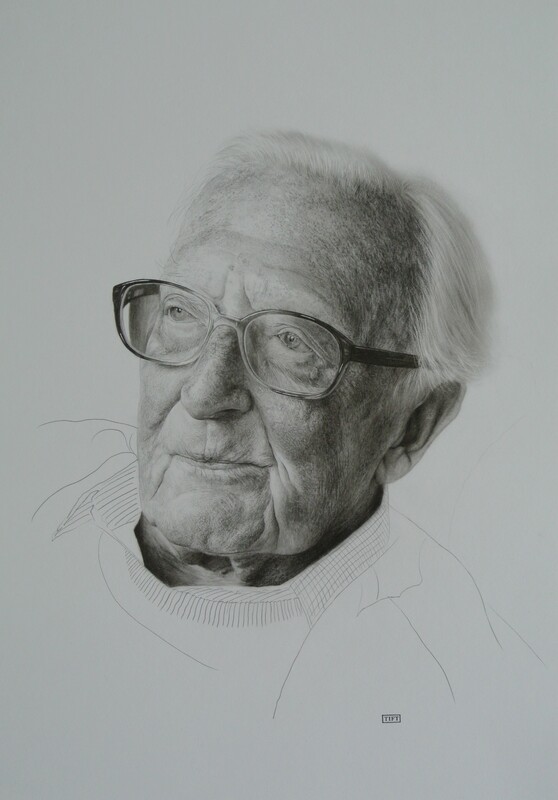 I’ve also added a drawing of Lord Carrington which I made before I started the painting. The Parliamentary Arts Committee also commissioned 4 films to accompany the portrait which explain it in much more detail and these are listed below. A few weeks ago now I went to Sandy Nairne’s leaving event at the National Portrait Gallery. 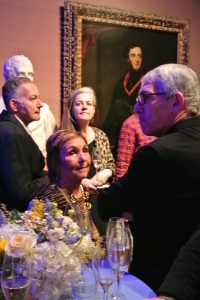 There was a huge turn out of the great and the good in the art world which is testament to the fact that he’s been such a great and effective Director at the Gallery. A great night. 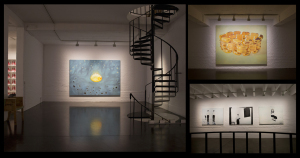 ” I wanted it to be a relaxed and informal depiction. One of the thinks Ken said to me during the sittings was that he always tried to appear calm during interviews and debates and never lost his cool so I wanted his pose to be calm, as if the viewer was in conversation with him and he was listening. I liked the idea of setting him in his garden rather than against architectural symbols of London which he is associated with because it was his little patch of London and I think he is very much perceived as a down to earth figure “. 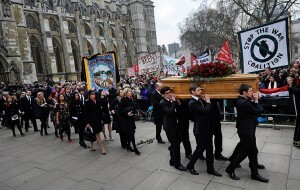 It was a real honour for me to have been invited to Tony Benn’s funeral at Westminster Abbey on Thursday. He made some enemies over the years but a lot more friends so the more intimate St Margaret’s Church in the Abbey was full to the rafters. It looked more like a demonstration outside as we went into the church with miners strike banners from the 80’s and Stop the War Coalition banners from the noughties , a huge crowd that he had encouraged and inspired over the decades. I found myself sitting next to , or in close proximity to Alastair Campbell, Peter Tatchell and George Galloway, quite a formidable trio. As Tony Benn became almost a “National Treasure” in later life, after he had retired, it’s easy to forget just how radical his politics was with mourners like Arthur Scargill, Gerry Adams and Martin McGuinness in the congregation. In fact I remember the afternoon after one of our morning sittings Gerry Adams was due to have a meeting with Tony Benn in his basement office. This would have been back in 1997 , still the very early stages of the peace process and I seem to remember shortly after this Benn was the first politician to invite Adams into the House of Commons for which he got a lot of stick from the press at the time. I also thought it was interesting to see Shirley Williams and David Steel there too after Williams , one of the Gang of Four who broke away from the Labour party in the early 80’s to form the SDP , largely due to the direction Tony Benn and Michael Foot were taking the Labour Party which caused a huge rift. 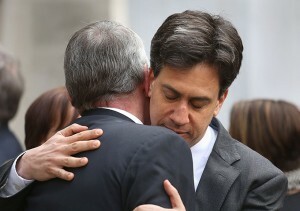 Tony Blair didn’t make the funeral , he sent Cherrie but something tells me Tony Benn wouldn’t have missed him. His 3 son’s and daughter made extremely emotional and articulate speeches towards the end of the service , the Benn spirit of oratory was in them all. Although I was only really an acquaintance of the family Hillary Benn made me feel like the closest family friend when he greeted me which is quite a skill. It certainly felt like the end of an era in many ways but he definitely lives on through his family. 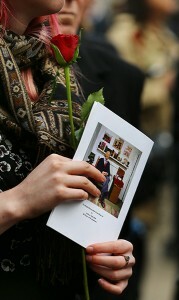 Photo’s courtesy of The Guardian. 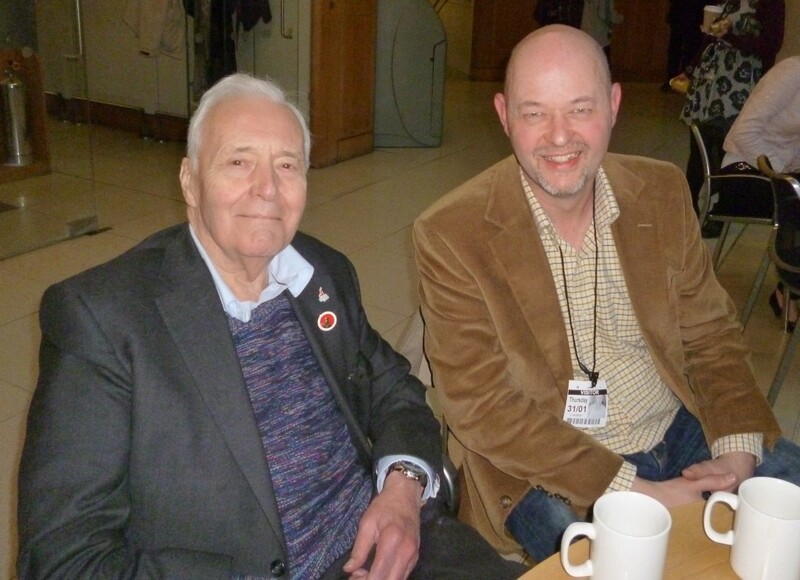 I was very sad to hear the news about Tony Benn’s passing. I knew that he was unwell and was kind of expecting an announcement but it still comes as a shock. It’s been a huge news story, as he got older he became a national treasure which is in stark contrast to his political hay day when he was hated by many. But ultimately he was a man of huge principal , conviction, passion and belief which the nation respected him for. Certainly I felt that he had a very purifying presence when you are in his company and you felt that there was a lot of good within him. The last time that I saw him was just before Christmas when we made a film about the portrait that I painted with him for the Palace of Westminster archive and website. I could tell then that he was getting older but bless him he still tried to light up his pipe in Portcullis House on 3 occasions during the filming to the dismay of the fire security man who very respectfully asked him not to. ( There’s a link to the film below). 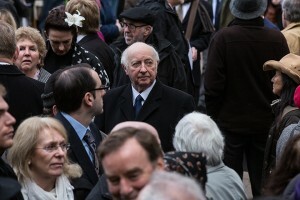 It was a privilege to meet Tony and become one of his many many friends and his contribution will never be forgotten. 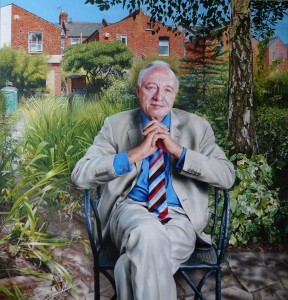 I can’t believe how this story about the portrait collection at the House of Commons has escalated. It’s been on every TV news channel , radio, broadsheet and even tabloid. 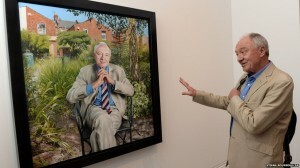 I think the most balanced and truthful piece was in yesterdays Guardian (which is attached above) by Jonathan Jones and it was very nice of him to focus on my portrait of Tony Benn which is in the collection. I imagine a journalist was invited to Portcullis House for lunch and was shown the collection and had the germ of an idea to gently massage a nerve. In truth it’s a none story, £250,000 spent over almost 20 years is actually peanuts in the scheme of government spending. And from it they have some great depictions and a few exceptional portraits from some of the best portrait painters in the country. Again, in truth many of the artists did the portraits very much in good will because in the early days of the collection there was very little funding so back in 1998 I took the view that it was a great project to do and other work would come from it which indeed it did. It’s a shame when issues like Syria have dropped off the news agenda in recent months this kind of inflammatory journalism can steal the headlines. 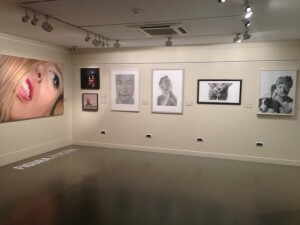 Plus One gallery who I show with in London are currently holding an exhibition at the main museum in Andorra. We’ve all got a few pieces in the show ( the gallery artists) and I believe that it is moving on to Barcelona afterwards. 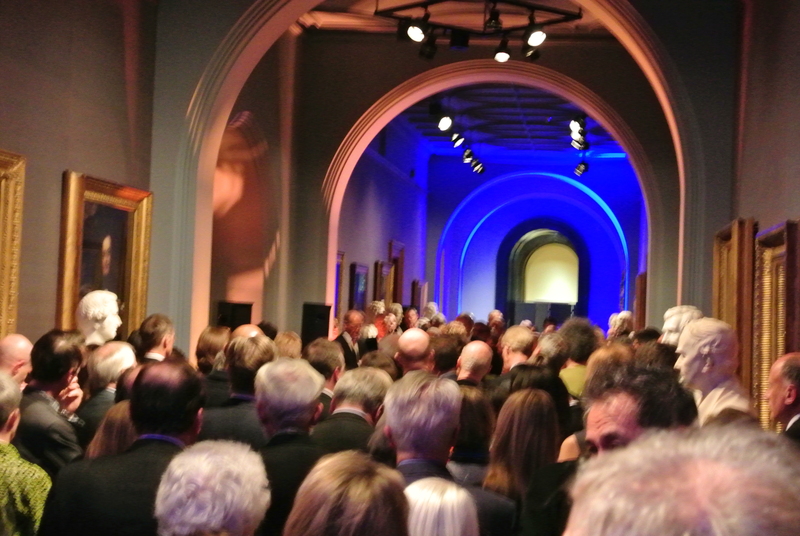 Here’s a photo from the opening,unfortunately I didn’t go. Sky Arts are making a series about portraiture. It’s a competition based programme, I guess a bit like the X Factor but without the cruelty. They invited me to a screen test with the magnificent artist Tai Shan Schierenberg to be a judge and they rightly chose Tai who is not just a wonderful painter but a natural on TV, I remember a show he made for BBC2 on Titian which was excellent. I think Kathleen Soriano is the other judge, formerly of the National Portrait Gallery and now head of exhibitions at the RA. It would have been a giggle with those two but Sky, you made the right choice, my accent isn’t made for TV. 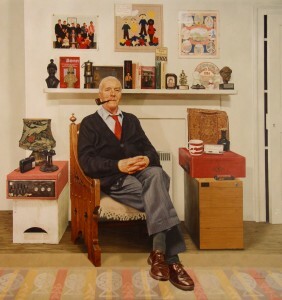 Some time ago now I was invited to make a short film with Tony Benn about the portrait that I made of him 15 years ago for the House of Commons. We’re sat infront of the portrait with his son Hilary who was asking the questions. 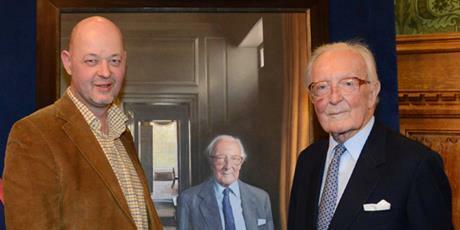 I’m doing another portrait for the Palace of Westminster , this time for the House Of Lords, of Lord Carrington. I’ve had a few meetings and sitting with him at the Commons and at his home but I won’t be starting it until next year. I’ve been doing quite a few paintings which I can’t talk about at the moment until they have been unveiled which is why I haven’t posted many lately. I’m currently working on a portrait for the National Portrait Gallery and have been since January but again I can’t say who yet…watch this space. © Copyright Andrew Tift Portrait Artist (2019 Portrait of a blog). All rights reserved.